As one of the world’s leading spark plug manufacturers, NGK SPARK PLUG has been igniting sparks since the 1930s. But sparks don’t just simply ignite. It takes a high amount of precision to create spark plugs that perform their task well and are extremely resistant in doing so. From passenger cars and bikes to Formula 1 and motorcycle racing, NGK SPARK PLUG has established itself as a heavily relied upon original equipment manufacturer (OEM). With its clear commitment to delivering the highest quality and continuously raising the bar, NGK SPARK PLUG is the obvious brand of choice for an array of vehicle manufacturers. In order to meet growing expectations, NGK SPARK PLUG regularly invests in research, technology and development. As a result, the company produces over 1,000 different types of spark plugs for every type of automotive engine, as well as for motorcycles, marine, power sport and many other applications. This is why the NGK product range has the right product for nearly every engine and every demand! As the main source of power in any petrol engine, a spark plug performs an essential function: It is responsible for igniting the air-fuel mixture in the combustion chamber of petrol engines. This combustion process creates power, ultimately setting the vehicle in motion. To make sure the combustion process runs smoothly, the spark delivered by the spark plug must ignite just before the piston reaches its highest point and the compression is at its greatest. As the main source of power in any petrol engine, a spark plug performs an essential function: It is responsible for igniting the air-fuel mixture in the combustion chamber of petrol engines. This combustion process creates power, ultimately setting the vehicle in motion. To make sure the combustion process runs smoothly, the spark delivered by the spark plug must ignite just before the piston reaches its highest point and the compression is at its greatest. The quality of this ignition influences several factors which are of great importance for both the driving operation and the environment, including smooth running, performance and efficiency of the engine as well as harmful emissions. NGK iridium spark plugs currently represent the highest-quality technological solution. They feature an iridium-alloy on the middle electrode welded on in a special process using laser. One of the world’s hardest metals, the precious metal iridium starts melting at a temperature of 2450°C and is therefore very resistant to spark erosion. By using it, the service life is doubled on average in comparison to standard nickel spark plugs. These spark plugs are equipped with a platinum plate on the middle electrode, which ensures a more constant output of the spark plug over the entire service life, even under difficult conditions. Based on its narrow middle electrode, it emits very little spark voltage, discharges the ignition coil, and ensures optimal combustion. One strategy for extending the service life of a standard nickel spark plug is to equip it with multiple ground electrodes. With such spark plugs, the spark continually jumps over to a different ground electrode. In doing so, the wear is distributed to up to four ground electrodes and the service life is extended. 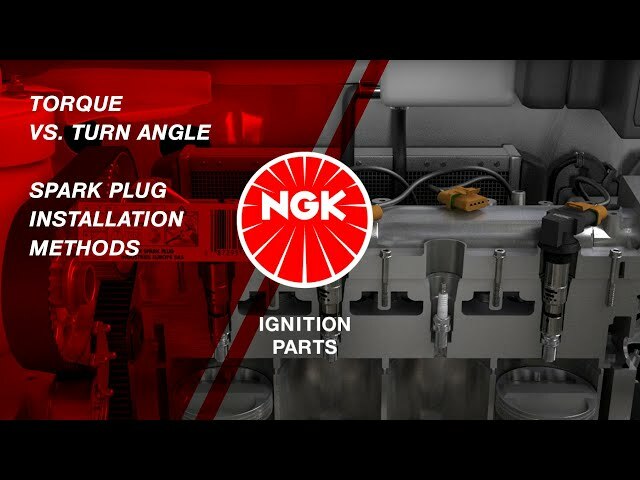 The principle of NGK SPARK PLUG’s patented V-grooved spark plugs is technically simple but very effective. A V-groove is situated in the centre electrode. This forces the spark to occur at the outer edge of the centre electrode where it is easier to ignite the air-fuel mixture. In addition, the voltage required to produce a spark is reduced. These two features give the benefit of improved ignitability, especially in modern low-emission lean-burn engines, even under extreme operating conditions. These spark plugs are equipped with a housing that is fit close to the insulator. If the insulator tip is clogged with carbon deposits, the spark voltage first flows down to the height of the fitted case. Since the jump to the case now represents lower resistance than flowing along the insulator, an arc-over to the housing and thus the ignition of the air-fuel mixture occurs. As soon as the spark plug reaches the self-cleaning temperature of 450°C, carbon deposits are burned off and the spark can reassume the normal path through the ground electrode. In the event of a carbon deposit clogging on the insulator or the insulator being at temperatures below the self-cleaning temperature, semi-surface spark plugs provide a reliable cold start. Because of this, they have at least two ground electrodes arranged on the side with a tapered point. The arc-over takes place from the tip of the middle electrode to the tip of one of the ground electrodes at the top end. By doing so, the spark initially creeps over the insulator tip. With this process, not only is the fuel-air mixture ignited; the insulator tip is also cleaned of carbon deposits with every spark. Developed for engines that tend towards increased carbon depositing as a result of their design, hybrid spark plugs have a “normal” ground electrode as well as two smaller ground electrodes to the side. The side electrodes come into action if the spark plug is clogged with carbon. In this case, the ignition voltage flows down the clogged insulator, direction of the thread. It passes by an area where the side electrodes are very near. Since the resistance to the side electrodes is smaller than the resistance of the insulator, the voltage jumps over to the side electrodes, enabling the spark plug to operate even under severe conditions. Once the plug has reached its operation temperature and the deposits are removed, it returns to “normal” operation, with the spark jumping between the centre and main ground electrode. Spark plugs used for racing must withstand especially hard stresses. The speeds during a race are frequently in excess of 15,000 rpm. Temperature, pressure, and vibrations in the combustion chamber are so immense that conventional ground electrodes could break or melt. For this reason, racing spark plugs often come with specially designed ground electrodes, the most extreme form with a ring-shaped ground electrode. The spark jumps from the middle electrode to the ring-shaped ground electrode. LPG LaserLine spark plugs are dual precious metal spark plugs specifically developed for gas-fuelled engines. The combustion of gas is different from the combustion of petrol and, therefore, requires spark plugs which are specially adapted to these conditions. The gas-air mixtures are more difficult to ignite, as more ignition voltage is required and the risk of failure of the ignition coils increases. NGK LaserLine spark plugs come with a lifetime of 60,000 km, clearly outperforming “normal” spark plugs.